Take 2 full-size, reusable templates, add clear instructions and the design flair of celebrity sewist Debbie Shore and what do you get? A collection of beautiful, functional and customizable totes. Tote bag making gets easier than ever with this innovative new product. 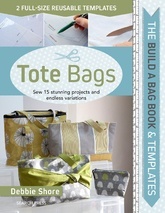 Inside the folder you’ll find a 96 page book of step-by-step instructions for 15 fabulous totes along with 2 plastic templates that will guide you in cutting the pieces for all of the projects. The templates are sturdy, wipe-clean, and don’t need to be pinned to fabric – just trace and go! Next thing you know, you’ll be sewing two sizes of bags with details including zippers, flaps, drawstrings, flat bottoms, and more that are as stylish as they are useful.